Flint Expatriates: Gordie Howe, R.I.P. Hockey sticks are slightly curved, to enable the player to better control the puck. 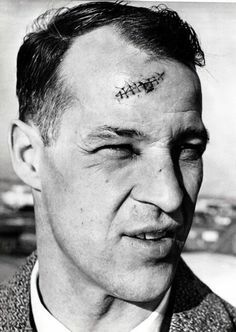 By suddenly switching grips, from left hand on top to right hand on top, Howe had given up some power and control, but he furnished surprise, as well as hand-eye coordination and power, backed up by an ability to either skate over a defender or flit around him. Mickey Mantle could bunt. Michael Jordan could flick a game-winning pass. Like that. “There was stunned silence, and suddenly the entire crowd went, ‘Oohhhhhh’ at the same time,” Picken recalled of the fans from Buffalo and Ontario.